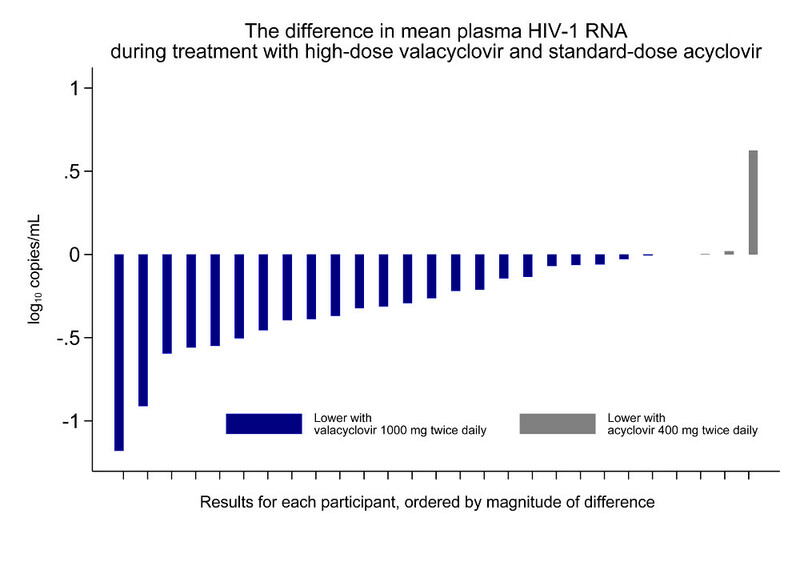 Difference in mean plasma HIV-1 RNA for each patient on high-dose valacyclovir versus standard-dose acyclovir. Each patient is represented by a bar. Blue bars are patients whose mean HIV-1 level was lower on high-dose valacyclovir, while gray bars are patients whose HIV-1 RNA level was lower on standard-dose acyclovir. Patients infected with herpes simplex virus 2 (HSV-2) have an increased risk of HIV-1 infection. In addition, HSV-2 reactivation in co-infected patients is associated with elevated plasma and genital HIV-1 levels as well as increased risk of HIV-1 transmission to HIV-negative partners. Multiple trials have demonstrated that, on average, co-infected patients taking the anti-HSV medications acyclovir or valacyclovir experience a reduction in HIV-1 plasma viremia. However, it is unclear if this reduction in HIV-1 levels is an indirect effect attributable to decreased HSV-induced inflammation, or if the medication is directly inhibiting HIV-1 reverse transcription. In a recent report published in JAIDS, Drs. Tara Perti (University of Washington), Anna Wald (Vaccine and Infectious Disease Division), and their collaborators demonstrate that HIV-1 viremia was lower in patients treated with high-dose valacyclovir compared to standard dose acyclovir, even though valacyclovir had no additional effect on HSV-2 shedding in these patients. These data are consistent with previous studies suggesting that acyclovir and valacyclovir treatment may directly inhibit HIV-1 replication. To determine whether or not HSV-2 suppression is correlated with HIV-1 suppression, Perti, et al. treated 28 Seattle-area anti-retroviral therapy (ART) naïve patients co-infected with HIV-1 and HSV-2. Patients were randomly assigned to one of two groups, receiving either the standard dose of acyclovir, or high-dose valacyclovir treatment for 12 weeks. After a two week washout period during which they received no drug, patients switched study arms, receiving the opposite treatment for another 12 weeks. HSV shedding was measured daily, while HIV-1 viremia was quantified weekly. A subset of patients also underwent more frequent HIV-1 testing at the initiation of valacyclovir treatment to determine the kinetics of HIV-1 decline. The team found that there was no difference in the amount of HSV-2 genital shedding (RR 0.95; 95% CI 0.66-1.37; p=0.78), shedding episode duration (p=0.68), or quantity of HSV-2 DNA detected (p=0.67) when comparing the acyclovir- and valacyclovir-treated arms. Although they did not find a difference in HSV-2 suppression, the team found that HIV-1 RNA is lower in patients receiving high-dose valacyclovir (0.27 log10 copies/mL, 95% CI -0.41 to -0.14 log10; p<0.001) compared to standard dose acyclovir. high-dose valacyclovir, which is much less expensive than ART, could have a role in delaying HIV progression and decreasing HIV transmission for persons in developing countries who are not yet eligible for ART according to their national HIV treatment guidelines, said Dr. Perti. Perti T, Saracino M, Baeten JM, Johnston C, Diem K, Ocbamichael N, Huang ML, Selke S, Magaret A, Corey L, Wald A. 2013. High-Dose Valacyclovir Decreases Plasma HIV-1 RNA More Than Standard-Dose Acyclovir in Persons Coinfected with HIV-1 and HSV-2: A Randomized Crossover Trial. 63(2):201-8.